Occasionally a death hits a community so hard, that there’s nothing you can say that can truly sum up what a person meant to the community they belonged to. Sometimes its best to leave it up to the people who were put on this earth to reach people. Like a 4 piece, mixed gender, pop band from Sweden. Truth be told, you’d be hard pushed to find a significant life event that Abba don’t have a song for, but in this case its a bit of a sad song. A lament if you will… “I had a dream” We all did. And we all lost that dream. June 11th, 2015 will forever be known as one of the darkest days in professional wrestling history, not because of a drug scandal, or a lawsuit, or someone committing some heinous unspeakable crime, or someone stealing an I-Pad case from a local shop. It’s a dark day simply because one of the brightest lights that ever graced the industry had its switch flicked for the last time. 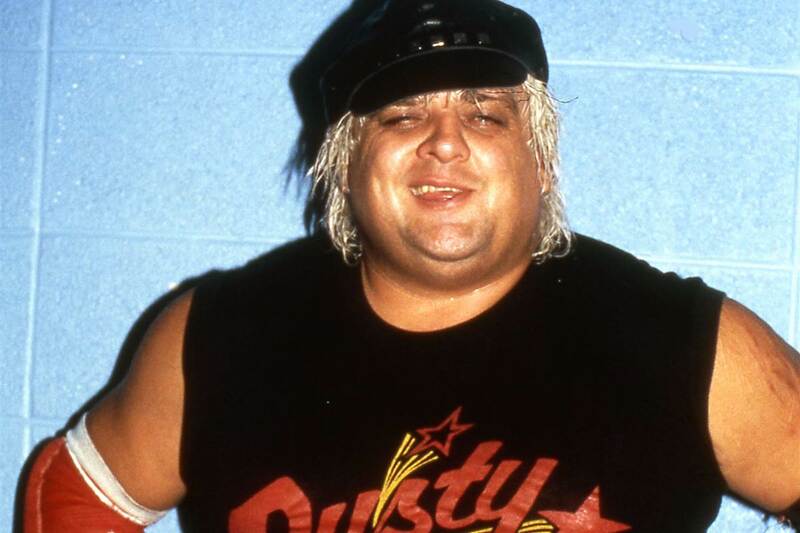 Dusty Rhodes passed away, aged 69. Dusty Rhodes is one of the few deaths that seems to have united the wrestling community. Not even the snidest of the snide have a bad word to say about him. Aside from his hugely talented sons, and the plethora of classic promos/matches/moments, that will be his legacy. Dusty Rhodes is the most relatable man to ever step into a wrestling ring. It would be a mission to find someone who believes his status in wrestling was unjustified, his title reigns were undeserved, and the adulation for him is misplaced. Even if you did find a person who thought any of those things, you’ve probably found yourself a prick. Or if its Virgil, someone probably paid him $10 to do so. The point is, Dusty Rhodes made you care about everything he was involved in, even the recent storylines involving his sons Cody and Dustin. That tag team match where it was them against Rollins and Reigns, with Dusty in their corner, and Ambrose in the opposite corner, was one of the most entertaining matches in recent WWE history, and a lot of that was down to how Dusty interacted with the match. Culminating with him knocking Ambrose the fugg out. He made you believe in everything. Every word that came out of his mouth, and every jiggly jab he chucked in the direction of an enemies chin mattered. That’s a skill that can’t be taught. Dusty’s death made me reflect on another significant death in the wrestling world that happened just over a year ago. The death of The Ultimate Warrior. My first wrestling tape was Summerslam 90, and the thing that attracted my young eyes to that tape was the fact that it my favourite wrestler in a steel cage match. That wrestler was The Ultimate Warrior. I went daft for his rope shaking, drugged out, mental antics. I went daft for steel cages. I went daft for Rick Rude and his tash. It was all magical to me. I must have watched that tape at least 2 or 3 times a week for the duration of my childhood, and in doing that you learn it inside out. 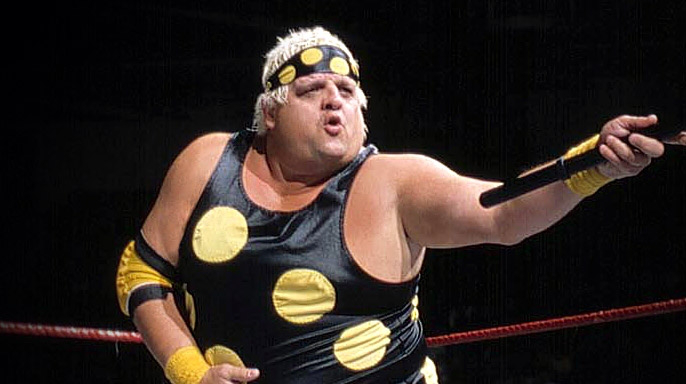 Even as a youngster, Dusty Rhodes made me care about his role on that show. He was supposed to wrestle Macho Man, but he needed Sweet Sapphire by his side, so he spent the duration of the show frantically looking for her. She was his manager and the wind beneath his wings dadday. Without her, he wasn’t Dusty. Without her, the polka dots were dull. The jabs didn’t shake, rattle or roll. The ‘bows weren’t bionic. She was nowhere to be found. No showed her match with Sensational Sherri, and Dusty was panicking. He even had Hacksaw Jim Duggan on the case, belting folk with his 2×4 if they didn’t have the information he needed. Then a story unfolded that every man on planet earth can relate to. When you’ve got yourself a woman. And she’s your world, you love her like like a fat kid loves milk n cookies babay. But one day. She starts smellin the sweet sweet smell of money. A sharp suited, well looted Million Dollar Man starts vying for her affections. He buys her gifts. Gives her rides in his fancy Limousine, with the Moet Chandon pouring, and the the caviar, and all of a sudden she don’t need The American Dream no more. She needs shiny jewellery more than she needs a common man, and just like that. The Million Dollar Man Ted DiBiase has stole your woman jack. The difference between The Ultimate Warrior and Dusty Rhodes respective deaths is that one was remembered for the huge amount of impact he made in a short space of time, and the other his remembered fondly for his impact spanning 4 decades. Warrior was known as an unpleasant man, who carved out a captivating niche for himself in the early 90s, but once people gained an appetite for promos that made sense, and wrestling that wasn’t always the same, his time was up. His extravagant financial demands never matched up with what you’d get in return, but for a few years he was everything. He made thousands of young fans fall in love with wrestling, and that was the nature of the tributes that flooded in for him. Reminiscing about a better time. With Dusty its different. His charisma made him timeless. The hard times promo is arguably the greatest one ever cut. It had everything. Intensity, humour, passion and depth. It spelled out why the World Heavyweight Title was so important, and why Dusty had to take it from that no good SoB Ric Flair. It told us they were enemies because they’re polar opposites, and Ric Flair put hard times on Dusty Rhodes, and in doing so he put hard times on every common man. That’s me. That’s you. That’s your dad. That’s the specky guy from they old Halifax adverts. That’s all of us. With every sentence you cared more about the match, and the man talking. Even if you’d never seen wrestling before and had no idea who this interesting looking guy in sunglasses was, you knew by the end of that promo. He might be a little thicker than the athletes you usually see. His belly might be just a lil big. His heiny might be just a lil big. But bruddah. He bad. And they know he bad. But it was the fact that he could slide back in to things seamlessly at pretty much any time and he could still make you care about what he was doing that made him special. As the brains behind NXT and the on-screen GM, and a constant influence on up and coming talent until the day he died. The wrestling business was forever touched by his genius. 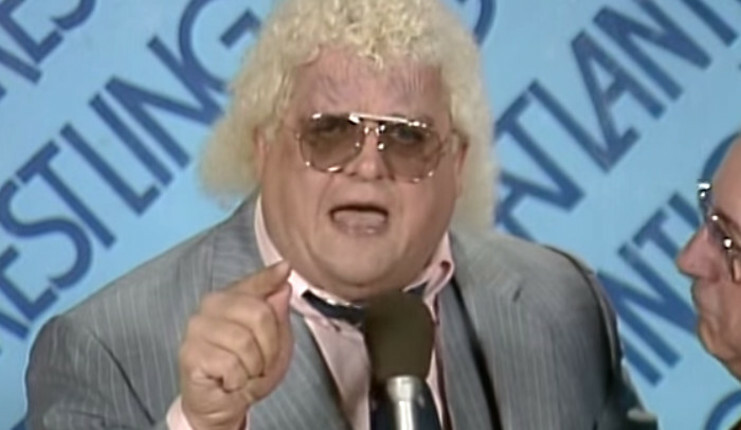 As a performer it was undoubted, but the side many people will forget was how much of a hand Dusty Rhodes had in moulding what the future will look like. If its helping someone who might be struggling with a promo, or just being the guy who can see what no one else can. His impact will forever be felt. Even if Cody never gets the run he deserves, Dusty will continue to look down on him proudly as he takes whatever WWE give him and makes it work. Has there ever been a character in WWE that has had more obscure, daft storylines than Cody Rhodes and made each and every one of them work? That’s talent. That’s what happens when you’re the American Dream’s littlest cub. He’ll continue to look down on Dustin proudly too, a man who at 46 is in the best shape of his career and continues to defy the aging process to perform at a level that matches and often surpasses some of the best young talents in the company. And whilst his sons will carry the Rhodes legacy on, this will be the last thing I will remember Dusty for. 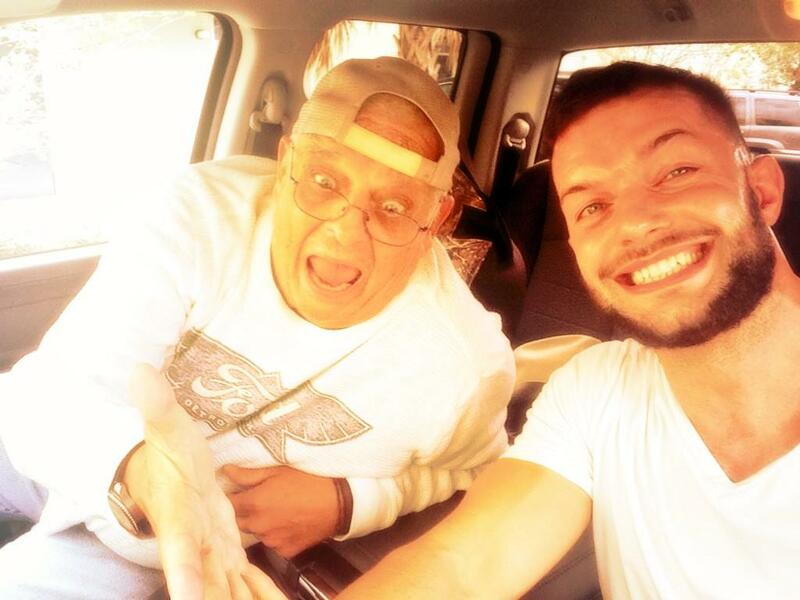 A new WWE signing from a foreign country comes over, and Dusty takes it upon himself to teach the young upstart how to drive. Because why leave the job up to a simple human driving instructor, when you could learn the ways of the road from the dream? Imparting his wisdom and making people smile until his very last day. There will never be another one quite like him. 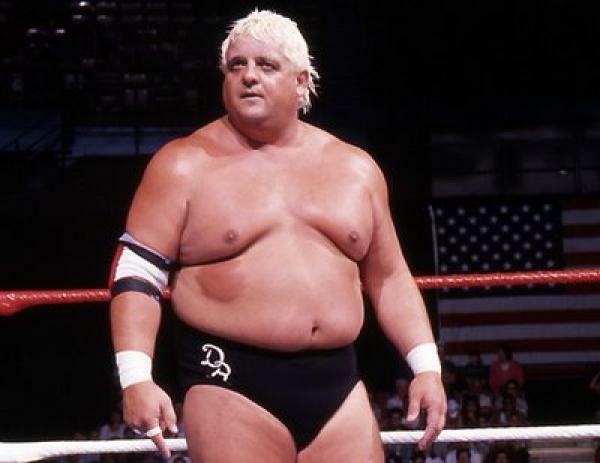 R.I.P Dusty Rhodes. This entry was posted in Opinion Stuff (Folk Ramblin A Lotta Shite), WWE and tagged cody rhodes, Dustin Runnells, Dusty Rhodes, finn balor, goldust, Ric Flair, wwe by snapmarenecks. Bookmark the permalink.